The DreamLine Toulon, part of the French Linea collection, is a single panel, walk-in shower design with a modern industrial touch to complement your shower space. The Toulon has a stylish window pane look, with a satin black finish that is bold and striking in any bathroom. The glass pattern is made using an application of JetGlaze durable paint, offering a unique style without the metal framing for easy maintenance. DreamLine exclusive ClearMax water repellent and stain resistant glass coating adds superior protection from stains and is nearly maintenance-free. Expand the possibility for efficient use of space with the bright and open design of a doorless shower with the DreamLine Toulon from the French Linea collection! Limited lifetime manufacturer warranty. Warranty for any hardware in French Black finish is limited to 1 (one) year. Call 1-866-731-2244 for complete warranty details, parts and installation inquiries. 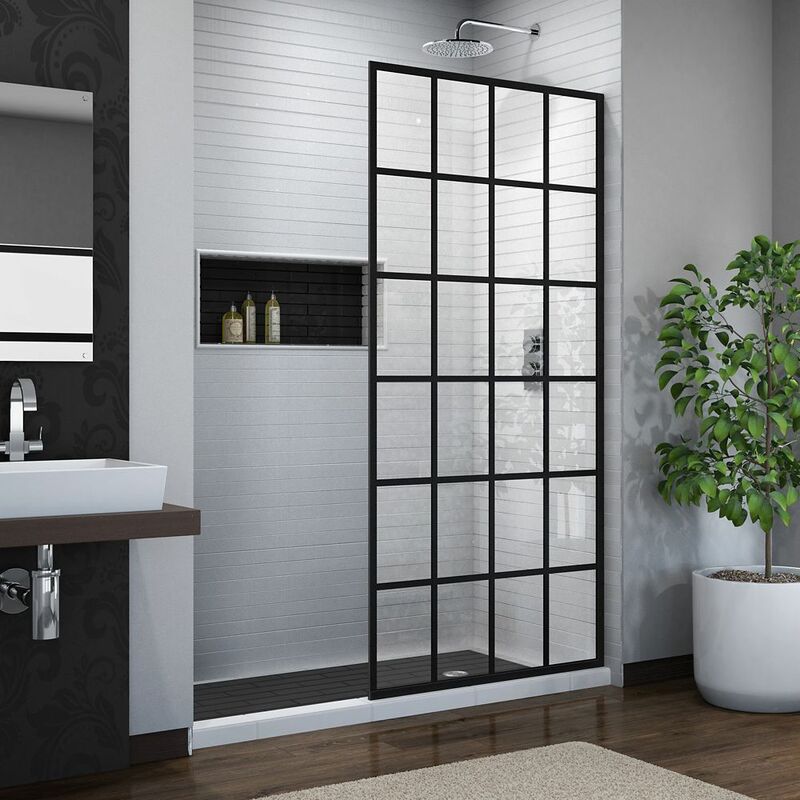 French Linea Toulon 34-inch x 72-inch Frameless Rectangular Shower Door in Patterned Glass The DreamLine Toulon, part of the French Linea collection, is a single panel, walk-in shower design with a modern industrial touch to complement your shower space. The Toulon has a stylish window pane look, with a satin black finish that is bold and striking in any bathroom. The glass pattern is made using an application of JetGlaze durable paint, offering a unique style without the metal framing for easy maintenance. DreamLine exclusive ClearMax water repellent and stain resistant glass coating adds superior protection from stains and is nearly maintenance-free. Expand the possibility for efficient use of space with the bright and open design of a doorless shower with the DreamLine Toulon from the French Linea collection! French Linea Toulon 34-inch x 72-inch Frameless Rectangular Shower Door in Patterned Glass is rated 4.6 out of 5 by 30. Rated 4 out of 5 by Sophie from It is exactly as expected. I like that the decorative... It is exactly as expected. I like that the decorative lines are within the glass as it makes it much easier to clean. It did need a fair bit of caulking to seal the bottom, but that is probably because we placed it into a vinyl shower insert and not a tiled base. Rated 5 out of 5 by KaylaM from Love the look in our new bathroom! Pick up at... Love the look in our new bathroom! Pick up at store was very easy. Our contractor said it was pretty simple to install. Rated 5 out of 5 by SRae from We are so pleased with how this turned out. Easy... We are so pleased with how this turned out. Easy to install, looks beautiful and finishes the bathroom nicely. Rated 5 out of 5 by Brooke from love it. works even on a wall that is not straight at all Love it! Our walls definitely are not straight but with the ubar they provide we were able to make it work great. Rated 5 out of 5 by Nan from It is absolutely perfect and it looks amazing. I... It is absolutely perfect and it looks amazing. I am going to put them in my other bathrooms because I love it so much. The mullions are actually embedded into the glass. The Glass is flat on the outside and the inside. There are not physical and are more etched in. Can the panel be installed either end of the shower enclosure, or must it be same end as the shower head to prevent splashing on the floor outside the shower? Where you decide to install the DreamLine French Linea Toulon is all up to you. Most people but at the shower head end to prevent splashing. In the end, it is your decision. If you have any other questions, please contact the DreamLine Customer Support Team at 866.731.2244. We are available 8am-7pm EST, Monday through Friday, and Saturdays from 9am to 5pm EST and will be happy to answer any questions you may have. You may also send an email to support@dreamline.com. Thank you for considering DreamLine! The French Linea Toulong is clear glass. The faux mullions are applied to the glass by DreamLine's&trade; proprietary JetGlaze&trade; process and are extremely durable. Please enlarge the photos on your computer monitor to better see the features of the panel. If you have any other questions, please contact the DreamLine Customer Support Team at 866.731.2244. We are available 8am-7pm EST, Monday through Friday, and Saturdays from 9am to 5pm EST and will be happy to answer any questions you may have. You may also send an email to support@dreamline.com. Thank you for considering DreamLine! The French Linea Toulon will work with any shower base as long as it is level and has a minimum threshold depth of 5/8&quot;. Keep in mind that the panel does not move, so you will want to have enough clearance to enter and exit your shower. If you have any other questions, please contact the DreamLine Customer Support Team at 866.731.2244. We are available 8am-7pm EST, Monday through Friday, and Saturdays from 9am to 5pm EST and will be happy to answer any other questions you may have. You may also send an email to support@dreamline.com. Thank you for considering DreamLine!